Young the Giant, a five piece band based out of California have been on my bucket list to see live since they exploded onto the scene in 2011 with their breakout single “Cough Syrup”. The group is now out on tour supporting their newest album Mirror Master and I was stoked to be able to catch them in Providence at the Strand Ballroom last week. Opening up the show was Canadian singer/songwriter Lights. A petite frame under a curtain of fiery red hair, Lights’ pixie like presence took the stage to an early packed venue. And it’s true what they say, that big things come in small packages. Lights powerful and flawless voice blended with the electro pop sound and dazzling stage light display to own the stage in Providence. Ravenous fans leaned over the barricade trying to get inches closer to the singer who connected with the audience on a powerful level. Lights performed a handful of tunes from her newest album Skin & Earth like “Skydiving” and “Giants” as well as older crowd favorites including closing the set with “Up We Go” from 2016’s Midnight Machines. Next up was Young the Giant. The quintet’s original sound and quirky front man Sameer Gadhir make for a captivating live show, and the group opted to start their set with the title track from their new album Mirror Master. The stage was illuminated in an elaborate light show and the audience was immediately owned from beginning to end. They played a variety of music from throughout their discography including two tunes performed in an ‘open session’ acoustic style. The best was definitely saved for last and YTG went out with a bang and a four song encore that included personal favorites like “Silvertongue,” “My Body,” and “Superposition”. 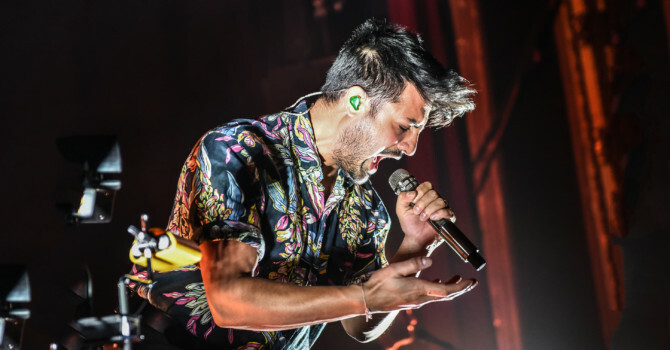 Both Lights and Young the Giant delivered a spectacular performance to Providence and we hope to see them again soon!